Planning a visit to the Nature Coast of Florida in the future? We invite you to join us for our weekly luncheon meeting. Citrus County, Florida is one of the most diverse counties in the state of Florida. We are known as the Nature Coast. Citrus County offers a wide range of outdoor activities including golf, saltwater and fresh water fishing, airboat tours, manatee tours, outdoor festivals, wilderness areas, a 47-mile Trail through the county for horseback riding, jogging, walking, and inline skaters. Rolling hills and naturally beautiful crystal clear springs, rivers and lakes set this section of Florida apart from cities in the state. Citrus County is approximately 70 miles north of Tampa on Florida’s West Coast and is located only a short distance from many of Florida’s hottest attractions and theme parks. Florida’s major airports are located only 2 hours away with shuttle services available. The north and eastern sides of the county are bound by the Withlacoochee River, the east by the Tsala Apopka chain of lakes and the west by the Gulf of Mexico. In addition to the Withlacoochee State Forest & Chassahowitzka National Wildlife Refuge, Citrus County has over 52 miles of gulf coast, 106 miles of rivers, and 19,111 acres of lakes. The 30 or so natural springs flow over 600 million gallons of water daily. Over 152,000 acres of its 683-square miles included wildlife parks and reserves. According to national sporting publications, we are ranked as one of the top 12 best fishing spots in North America. Our club was started in 1985 and chartered in 1986. John Gibbs was appointed as President. 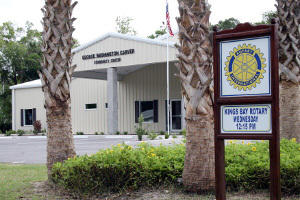 Since 1985 the club has been involved in the Crystal River community and beyond. bringing an iron lung to the area to demonstrate the need for contributions to the Rotary aim of the eradication of polio worldwide. An aim ALMOST achieved with only 39 cases worldwide.